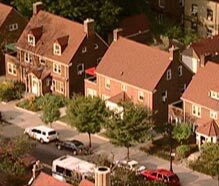 TOP: A view of houses in Riverdale. 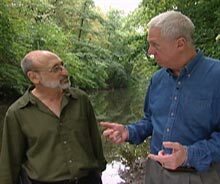 BOTTOM: David and Barry discuss the history of the Bronx on the banks of the Bronx River. Receive A WALK THROUGH THE BRONX on DVD when you pledge now! "Everyone remembers when the Bronx was burning. Well, now the Bronx is building," comments historian and tour guide Barry Lewis as he waits for his cue while filming the newest video walking tour from Thirteen/WNET New York. With its rich history, diverse neighborhoods, and world-class cultural and educational institutions, the Bronx is a great place to live, work and visit. In recent years, New York City's northern-most borough has been enjoying an unprecedented era of urban renewal and community pride. A WALK THROUGH THE BRONX WITH DAVID HARTMAN AND HISTORIAN BARRY LEWIS premiering Monday December 5th at 8 p.m. (E.T) on Thirteen, heads uptown crisscrossing the borough's neighborhoods and parks, streets and the boulevards, alleyways and expressways to take viewers on a fascinating tour -- not just through place, but through time. Hartman and Lewis tell this very different Bronx tale with the help of locals and others who have a special connection to the borough. They talk with actor/comedian Robert Klein at his alma mater, DeWitt-Clinton High School, and with New York Yankees manager Joe Torre in "the house that Ruth built," Yankee Stadium. Other visits include those with Todd A. Forrest of the New York Botanical Garden; Father Joseph M. McShane, S.J., president of Fordham University; Dr. Steve Sanderson, president of the Wildlife Conservation Society; Tom Nye, City Island historian; and the owner of Borgatti's Ravioli & Egg Noodles in the Italian community of Belmont. Other stops include the 250-acre New York Botanical Garden; the Bronx Zoo, the nation's largest urban zoo; the Bartow-Pell Mansion, the Van Cortlandt House, Edgar Allan Poe Cottage, the newly-renovated Loews Paradise Theater on the Grand Concourse, and Orchard Beach. There's even a stop at Woodlawn Cemetery. As the final resting place of such Bronx luminaries as Herman Melville, Duke Ellington, Elizabeth Cady Stanton, Joseph Pulitzer, Fiorello LaGuardia, and Robert Moses, the cemetery is a testament in stone to the impressive contributions and enduring legacies of the borough and its people. A WALK THROUGH THE BRONX is Hartman and Lewis' tenth "Walking Tour" program. The series, one of the most popular in Thirteen's local programming line-up, launched in 1998 with A WALK DOEWN 42ND STREET, followed by explorations of Broadway, Harlem, Brooklyn, Greenwich Village, Central Park, and Queens, as well as Newark and Hoboken across the Hudson. A WALK THROUGH THE BRONX WITH DAVID HARTMAN AND HISTORIAN BARRY LEWIS is a production of Thirteen/WNET New York. James Nicoloro is producer. Suzanne Glickstein is co-producer. John DeNatale is executive producer. Tammy Robinson, vice president for programming, is executive in charge. Major funding for A WALK THROUGH THE BRONX is provided by Con Edison and JPMorgan Chase. Additional funding is provided by Fordham University, the Wildlife Conservation Society/Bronx Zoo, Milton and Eleanor Levine, and the New York Yankees. Thirteen/WNET New York is one of the key program providers for public television, bringing such acclaimed series as NATURE, GREAT PERFORMANCES, AMERICAN MASTERS, CHARLIE ROSE, RELIGION & ETHICS NEWSWEEKLY, WIDE ANGLE, SECRETS OF THE DEAD, AND CYBERCHASE - as well as the work of Bill Moyers - to audiences nationwide. As the flagship public broadcaster in the New York, New Jersey and Connecticut metro area, Thirteen reaches millions of viewers each week, airing the best of American public television along with its own local productions such as THE ETHNIC HERITAGE SPECIALS, THE THIRTEEN WALKING TOURS, NEW YORK VOICES, AND REEL NEW YORK. With educational and community outreach projects that extend the impact of its television productions, Thirteen takes television "out of the box." And as broadcast and digital media converge, Thirteen is blazing trails in the creation of Web sites, enhanced television, CD-ROMs, DVD-ROMs, educational software, and other cutting-edge media products. More information about Thirteen can be found at: www.thirteen.org.